“For over a week, Palestinian soccer fans have been enjoying a special Christmas-season present: the first visit by Chilean soccer club Deportivo Palestino to the West Bank. Two-time winners of Chile’s Premier Division and quarter finalists in this year’s Copa Sudamerica, Palestino was founded in 1920 in the capital city Santiago by Palestinian immigrants. The team has a huge following among Palestinians and President Mahmoud Abbas once described the club as a “second national team for the Palestinian people.” “The main purpose of this visit is to reconnect the team to our origins in Palestine,” said team general manager Christian Elben Nazal, whose father immigrated to Chile from the town of Beit Jala. Chile is believed to be the home of the largest Palestinian community outside the Arab world, most from the historically Christian towns of Beit Jala, Bethlehem and Beit Sahur. The team’s red, white, black and green jersey represents the colors of the Palestinian flag and the community’s attachment to their ancestral land. Palestinian sports officials are hoping the visit will push the game of soccer forward here. “They will see how sports here suffer,” said Hisham Abu Shekhidem, a team manager and a former player for Hebron’s Al-Ahli soccer club. “We will gain experience from them and this will help our national team.”Like so many other aspects of Palestinian life, soccer is clouded by the rocky relationship with Israel. 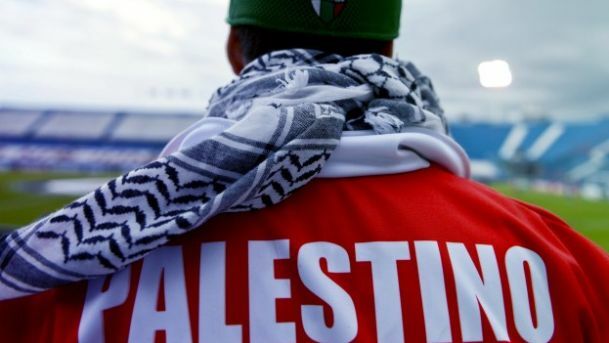 The Palestinian soccer federation has repeatedly attempted – unsuccessfully – to have Israel expelled from the FIFA world soccer federation on various grounds, accusing Israel of blocking the movement of athletes and saying that teams in West Bank settlements are illegal. While the Palestinian national soccer team currently ranks far behind at 133, according to this month’s FIFA rankings, Roberto “Tito” Bishara, a former player for Palestino and the Palestinian national team, is optimistic that the team will improve. “I know how much they are trying to develop soccer here. I’m sure Palestine will be in a World Cup soon,” Bishara said.